Our host decided to pay tribute to whisky veteran Jim McEwan with an interesting line-up bottled by “That Boutique-y Whisky Company.” And what could be more quintessential than a whisky from Bruichladdich? Nose – A peculiar sour, metallic copper, mineral, sharp, rubbing alcohol, quite odd…. as we gave it more time, started to find liquorice, salt, light hint of bitter orange peal, wondered if there was a bit of tobacco leaf? A bit of spice then shifted back to an eraser or rubber. Palate – Was that a light fruitiness now emerging? One of the best quotes is this whisky was like “Art Cinema!” A bit difficult yet worth exploring. That is exactly what is wonderful about the world of whisky – with such a range to click with practically every palate preference. And sometimes it is good to have a more challenging whisky – something a bit weird just to shake things up and make it interesting. The wonderful Bruichladdich distillery on the Isle of Islay was founded back in 1881, and for a long while they happily produced tasty whiskies for the enjoyment of all. In the latter half of the 1900s, the distillery was closed and reopened a number of times, though the doors are firmly open these days, with some phenomenal and inventive whiskies flying out of them (well, not actually flying – they’re probably transported on a truck of some description). They’ve produced a number of stunning expressions, and often they’ll let you in on the thought that goes into the direction they wanted to follow with the whisky. This has resulted in some intriguing ranges with all sorts of weird and wonderful names – many of which are referenced on the label of our Bruichladdich bottling. Nose: Caramelised dates, polished oak, a hint of oatcake and white wine. Palate: Continued wine-like fruitiness, followed by a crack of black pepper. Finish: Mineral dryness and strawberry laces. And what would this Bruichladdich set you back for a 50 cl bottle? The recommended retail price is £76.95. What else did we sample in our tribute to Jim McEwan? As for other Whisky Lady Bruichladdich explorations? Too many to count… yet here are a few highlights, including Whisky Live Singapore 2016 and an amazing Peat Progression Evening! 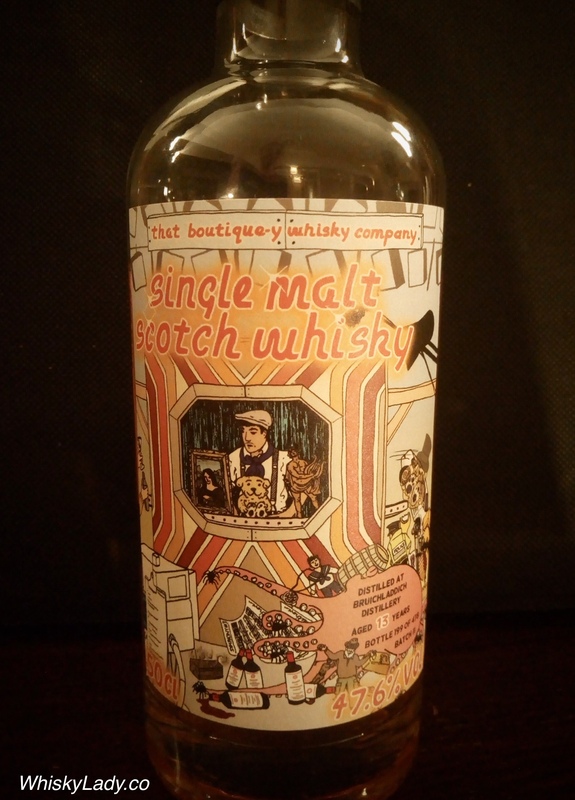 This entry was posted in Islay, Scotland and tagged Bruichladdich, Bruichladdich 13 year, John McEwan, That Boutique-y Whisky Company by Carissa Hickling. Bookmark the permalink.